Over the past decade I’ve had a hard time ignoring the similarity between model railroader’s penchant for impulse buying/indiscriminate accumulation as compared to the same issue in any other retail setting. I’m not sure there is a difference between purchasing more shoes than there are days in the week as opposed to buying dozens of structures none of which seem to be earmarked for any particular future purpose and none of which are ever assembled. In both cases it comes down to the brief high from ‘getting the fix’ and buying something. After that, the purchased item rarely sees the light of day. The enjoyment is short lasting indeed. The only solution if you want to prolong the feeling is to buy something again. I’d like to focus on structure kits for now although rolling stock runs a close second. For many, many modelers structures are their favorite part of the hobby, at least buying them is. In many cases the purchase is rationalized when in reality it is just satisfying a craving. The accumulated kits are unrelated to any central theme or era and go un-built. In many cases the purchaser doesn’t have a layout either by choice or circumstance. I’ve written before that, although there are many ways to participate in the hobby, accumulation of merchandise without any intended purpose is not one of them. After the initial high of making a purchase, the modeler gets none of the long term satisfaction that they should seek from a hobby. I do believe this can be turned around though if we change our thinking towards structures in general. We have several flaws in our thinking. The first is that there is no value in assembling a structure if it won’t eventually be on a model railroad. That’s not true. The second flaw is assuming that the value of assembling a kit is in the finished product. The third flaw is that we need to keep assembled models after they are done. We don’t. In all three cases we overlook the fact that the value is in the process, the satisfaction of assembly if you will. This can be no small thing. The great news is that you don’t need to ever have a layout in order to achieve this satisfaction. A valuable lesson could be learned by taking a cue from our cousins in the military or automotive modeling side of the hobby. They don’t have model railroad layouts or other settings to place the completed model and yet on they march in total bliss assembling an F-15 one month, a warthog the next. Unlike military modelers however, we railroaders face a problem. While an 1/48 model of an aircraft may only be a foot long and a few inches tall, many completed structure models are quite large, often taking up four or five square feet. That raises the significant issue of what do we do with the darn things when they are done? If we change our perspective on model railroad structures and align it more towards that of the military modelers we are now in a position to get true satisfaction from the hobby even if we don’t have a layout. Get in the habit of assembling your structure kits for one simple reason, the joy and satisfaction of assembly. Whether you have a layout or not is irrelevant. If a particular kit appeals to you, BUILD IT. With a finished kit in hand we hit the stumbling block that trips most people up and keeps them from building the kit in the first place. What do you do with it now? As mentioned before it may be fairly large. There are three things you can do. If your structure models are fairly small, treat yourself to a nice display case and put them in there. The second option is to give them away or sell them, although this may not be so easy and be more trouble than it’s worth. The third option will be difficult for many to accept and that is to simply pitch them. What? That’s right, throw the kits away. Keep them awhile, photograph them and then eventually pitch them. If a particular model has given you forty or fifty hours of relaxation and satisfaction that’s saying quite a bit. It’s served its purpose. If you don’t have a place for it, no use for it, throw it away and start on the next one. Look at this way, attending a sporting event with parking may cost well over a hundred dollars and provide four or five hours of enjoyment. After the event is over we have no more expectations for our entertainment dollars. We spent our money, we were entertained, and that’s the end of it. Why should modeling be different? The same hundred dollars spent on a structure kit will certainly provide more than a few hours of entertainment. Model building provides more entertainment hours per dollar spent than most other pastimes. It’s a great value. So far we’ve been talking about structure accumulation for those with no layouts. 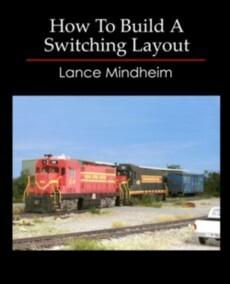 Those with layouts or those about to get layouts face another problem. They have an inventory of kits accumulated over decades that, while interesting on an individual basis, have absolutely ZERO relationship to each other or any central theme. Because the modeler spent money getting them, they feel compelled to use them on the layout. They shouldn’t and trying to do so creates unforeseen problems. Often designs are forced around awkward structure footprints as opposed to letting the theme drive the design. After the layout is built and the random structures placed willy nilly on its surface, it lacks visual cohesiveness. In essence the layout has been forced to be a display case, something that just doesn’t work visually. An analogy would be buying clothes for a vacation before you know where you are going. Rather than looking like a model of a railroad the layout looks like a retail store front. The only way to get a cohesive look with a model railroad is to design it first, and THEN purchase the structures. This isn’t to say that buying those structures was wasted money. 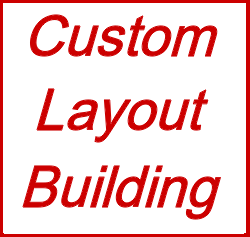 The layout and your structure building can be split out as two separate pastimes. There is no reason you can’t build a structure for the sheer joy of doing so and simply not use it on your layout. The point of all this is to change our view on structures and the role they play with how we derive satisfaction from them. There can be a tremendous amount of enjoyment obtained simply from building them! So, build them. Spending time doing a relaxing and satisfying task is the sole reason for having a hobby. Let’s get away from over thinking structures and requiring that each and every one of them have a future role after they are completed.